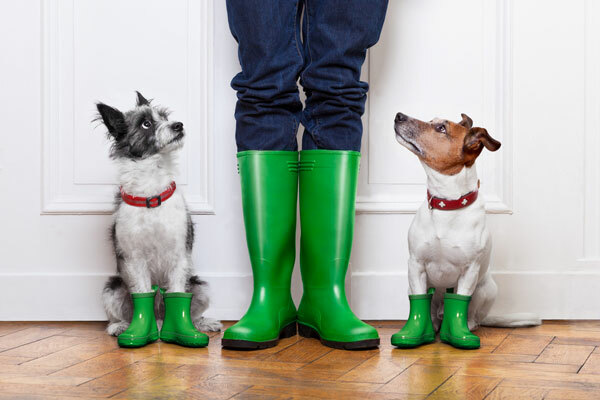 Mudroom hooks are a must for any dog parent. Photography by Javier Brosch / Shutterstock. Placed by a door, these are perfect for storing leashes and harnesses. They’re easy to access as you head out, and leashes are less likely to get tangled up when hanging versus being tossed into a bin. A multi-hook system works best for dog items. A shelf above your hooks can hold a small container filled with poop bag rolls. Or make a little drawstring bag out of fabric, fill it with poop bags, and hang it from one of the hooks. Either way, your extra poop bags are in easy reach, and those are something you’re going to need! Gear that’s used exclusively for hiking and adventures can stay in your car. 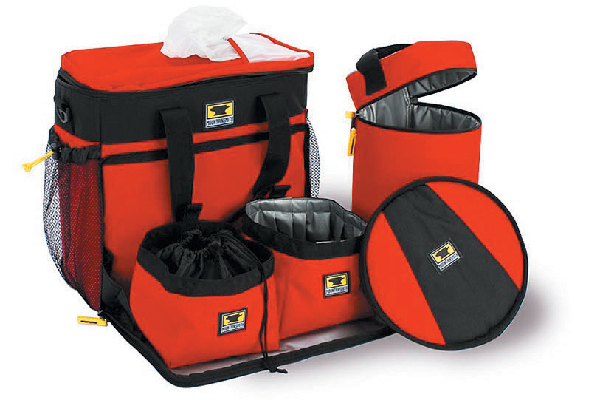 A collapsible trunk organizer keeps everything in place. Use a storage ottoman or any sturdy box as a toy chest. You can even train your dog to put his own toys away before bed! 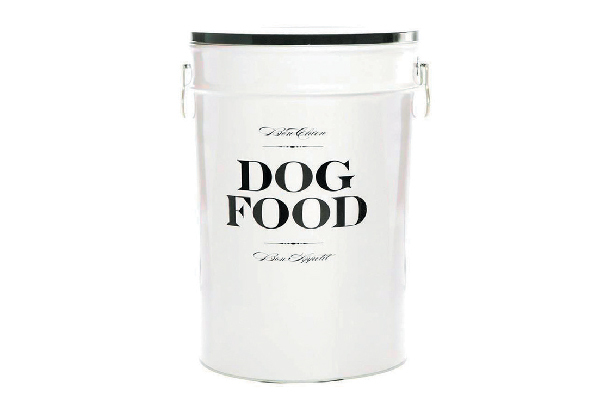 Look for this fun dog food storage container at sylvesterandco.com. A stylish food can holds a bag of dog food. Of course, if your pup is like Riggins, he’ll figure out how to get into that quickly. In that case, invest in a vault-style container made for dog food. Note: Wash the container out fully after finishing the dog food before putting in new dog food. The remnants left behind can turn rancid. Self-dog wash places have little baskets full of cleaning and grooming supplies. You can do this at home, too. Keep shampoo, conditioner, small towels, brushes and other grooming supplies in a shower caddy for easy transport to wherever you need it. Plus, it makes for fast and simple storage under the sink. 7. Dog overnight and play bag. Mountainsmith’s K-9 Cube Travel Pet Bag lets you keep all your dog’s travel accessories in one convenient pack. Your pup’s suitcase can double as a place to keep items you don’t need all the time like his extra-long leash and beach frisbee. You’ll find many bag options online or at your local pet store. Personally, I’m in love with the Mountainsmith K9 cube. ProudDogMom.com suggests printing out your vet records and keeping them in a 3-ring binder. She even has downloadable vet/health record pages for you to use. Target’s Pinterest puts a twist on the hook system by using a shelf with S hooks that one would traditionally find in the kitchen holding cookbooks and cooking tools. GoPetFriendly.com uses a seat organizer, the kind that hangs on the back of the front seat and has multiple pockets, to organize items she needs for her dog while traveling. RoomForTuesday.com puts the pup’s food and water bowls in a low drawer that can be pushed in. It even gives you instructions on how to build your own. No matter how you organize your dog’s gear, I’m sure he is happiest when it is in use! A dog watching his toys getting cleaned. Photography ©Jevtic | Getty Images. If you’re not sure whether that old well-used toy can be cleaned or should just go in the trash, check out these tips. If the toy is falling apart, toss it. Squeakers and pieces of plastic toys can be a choking hazard. If the toy looks worn, it’s time to get a new one. Toys aren’t supposed to be eaten. If your pup is biting off pieces and using them as a snack, toss that toy in the garbage. 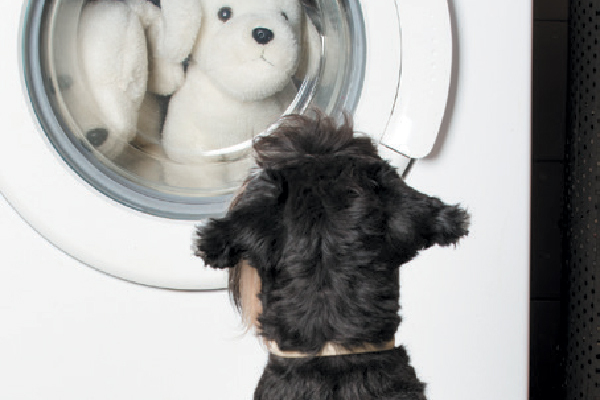 Clean toys once a month to keep them from growing bacteria or mold that can cause your pup to get sick. Put hard toys in the dishwasher’s top rack. Skip the detergent — use vinegar instead. Put soft toys in the washing machine. Again, skip any soap products, and use vinegar. Air drying isn’t a must, but it’s best if weather allows. Clean rope toys like you would a sponge. Get the rope toy wet, and microwave it for one to two minutes. Make sure all parts of the rope toy can be microwaved safely before trying this technique. (Don’t microwave — plastic or metal!) Be careful, that toy is going to come out hot! Bleach can be used if done carefully. The ASPCA suggests using a diluted solution and fully rinsing the toy after cleaning. Thumbnail: Photography by Corey Gaffer Photography. The post How to Organize Dog Gear appeared first on Dogster.